Among malignant tumors, lung cancer is a leading global cause of death due to its aggressive tumor evasion and metastasis characteristics [1, 2]. Surgery is generally regarded as the standard of care for patients with early-stage and oligometastatic non-small cell lung cancer (NSCLC) [3–6]. Recently, stereotactic ablative radiotherapy (SABR), a high-precision treatment approach that combines multiple technological advancements for the delivery of radiation, has become increasingly useful as a significant alternative therapy for patients with early-stage and oligometastatic NSCLC who are at high risk of various surgical complications [7–13]. Notably, the effectiveness of SABR for early-stage NSCLC is comparable to that of surgery. A pooled analysis of two independent, randomized, phase III trials showed that overall rates of 3 years survival were 95% in the SABR group and 79% in the surgery group for operable stage I NSCLC . Additionally, for oligometastatic NSCLC and lung metastases, SABR showed remarkable efficiency with regard to local control and survival [11–13, 15]. Lodeweges et al. , meanwhile, reported 5-year overall survival rates of 41% for surgery and 45% for SABR in patients with pulmonary oligometastases. Multiple parameters, such as occurrence, development, recurrence, and metastasis of tumors, comprise processes by which tumors evade immune surveillance; this evasion is closely related to host immune function. Many studies have investigated the predictive values of peripheral and tumor-infiltrating lymphocyte (TIL) subsets to assess tumor response to chemotherapy, radiotherapy, and chemo-radiotherapy in various tumors [18–23]. For example, several previous studies have revealed significant correlations between a variety of parameters (e.g., CD4+ TILs, CD8+ TILs, tumor-infiltrating myeloid-derived suppressor cells, and peripheral lymphocyte number) and the tumor response to neoadjuvant chemo-radiotherapy for advanced rectal cancer [19, 24]. In a study of breast cancer patients, the TILs and PD-L1 assessed in the epithelium or stroma were predictive of a complete pathological response to neoadjuvant chemotherapy . Additionally, peripheral CD8+ T-cell counts, CD3+ T-cell counts, CD19+ B-cell counts, and CD4/CD8 ratio all showed relationships with tumor response to carbon ion radiotherapy in patients with prostate cancer . The activation of CD8+ T cells involves both the T cell receptor (TCR) and CD28 signals [26, 27]. As an essential co-stimulatory molecule, CD28 on CD8+ T cells interacts with B7 molecules on antigen-presenting cells to activate the anti-tumor immune response of CD8+ T cells to tumor antigens. However, CD8+ T cells in cancer patients can lose the expression of CD28 due to the chronic stimulation of tumor antigens and consequently present with a non-responsive status to tumor antigens [28, 29]. We also reported this phenomenon in our previous study, as did other studies, that decreased CD8+CD28+ T cells and increased CD8+CD28− T cells were observable in NSCLC patients when compared with healthy volunteers [30–32]. In two recent studies, PD-1 inhibited the function of T cells by inactivating CD28 signaling, and PD-1-targeted therapies rescued CD28+ cells but not CD28− cells among CD8+ T cells, suggesting that CD28 signal plays vital roles in regulating the function of effector T cells [33, 34]. Thus, CD8+CD28+ T cells may exert anti-tumor efficiency among CD8+ T cells. More importantly for SABR, a growing number of studies have shown that its remarkable efficiency is partially a result of host immune status and the interaction between SABR and the immune response [35–37]. Specifically, SABR could facilitate the immunogenic cell death of cancer cells, release tumor antigens, recruit antigen-presenting cells to present antigens to T cells, and activate the antitumor effect of CD8+ T cells through TCR and CD28 signals . Thus, we speculate that the CD8+CD28+ T-cell count is associated with the response to SABR in patients. However, thus far, no previous study has examined the predictive value of immune factors for early tumor response to SABR in patients with lung metastases. Therefore, our aim consisted of evaluating the predictive roles of pre-SABR CD8+ T-cell counts, CD8+CD28+ T-cell counts, CD8+CD28− T-cell counts, CD4+ T-cell counts, and Treg-cell counts in peripheral blood for early tumor response to SABR in patients with lung metastases from NSCLC. CD28 is a co-stimulatory molecule that is required for CD8+ T cells to develop an anti-tumor response [33, 42–44]. A recent study revealed that exhausted CD8 T cells are rescued by PD-1-targeted therapies in a CD28-dependent manner . In contrast, the loss of CD28 expression causes CD8 T cells to lose cytotoxic function and inhibits T cell proliferation . Thus, we focused on the role of CD8+ T cells, CD8+CD28+ T cells, CD8+CD28− T cells, and other immune cells in patients with lung metastases undergoing SABR. To the best of our knowledge, the present study is the first of its kind to investigate the relationship between peripheral CD8+CD28+ T-cell count and early tumor response to SABR. We found higher peripheral CD8+CD28+ T-cell counts in patients who were responsive to SABR than in those who were non-responsive. Using logistic regression analyses, we revealed the independent predictive value of the CD8+CD28+ T-cell count for early tumor response to SABR. Treg cells contribute to the prevalence of immunosuppressive mechanisms by inhibiting the immune response toward a variety of cancer cells [53, 54]. Several studies have revealed the adverse effect of peripheral and tumor-infiltrating Treg cells on survival and tumor response in NSCLC patients after treatment [55–57]. Our results showed no significant correlation between Treg-cell counts and tumor response to SABR; we suspect that this may be related to the limited number of samples. The results of several studies suggest that early tumor response after treatment may be associated with the survival of cancer patients [58–62]. For example, a CR after neoadjuvant chemotherapy correlated with better survival in estrogen receptor-positive/human epidermal growth factor receptor 2-negative breast cancer . According to Tao et al. , patients with pathological CR were found to have better survival than those without pathological CR in advanced NSCLC individuals undergoing radio-chemotherapy, and the difference between the two groups reached statistical significance in relapse-free survival. With that in mind, we proposed that 1-month tumor response to SABR could as well predict survival in NSCLC. Thus far, few predictors have been investigated to determine tumor response after SABR. High BED10 has been associated with better tumor control through the direct cell-killing effect of radiation [17, 63]. Per this suggestion, we found that BED10 correlated with better tumor response to SABR. Previous studies have also shown that the shrinkage of the lung lesion by at least 20% at the last session of SABR, combined with the mean and maximum pre-SABR standard uptake values, were predictive of complete response 6 months after SABR [16, 17]. Our investigation did identify an additional factor, the pre-SABR CD8+CD28+ T-cell count, as predictive of early tumor response to SABR. 12967_2019_1872_MOESM1_ESM.docx Additional file 1: Figure S1. ROC curves for CD8+CD28− T-cell counts (A); Treg-cell counts (B); CD4+ T-cell counts (C); CD8+ T-cell counts (D); CD8/Treg ratio (E); and CD8/CD4 ratio (F) to distinguish responsive from non-responsive patients 1 month after SABR. Figure S2. CD8+CD28+ T-cell counts in responsive and non-responsive patients (A) and ROC curve for CD8+CD28+ T-cell counts to distinguish responsive from non-responsive patients (B). CD4/Treg ratios in responsive and non-responsive patients (C) and ROC curve for CD4/Treg ratios to distinguish responsive from non-responsive patients (D) 6 months after SABR. Figure S3. 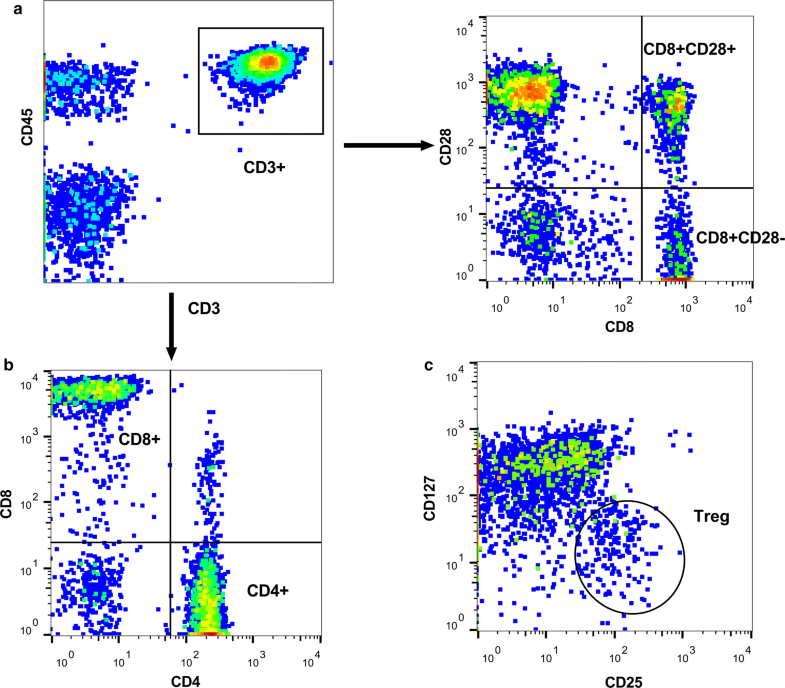 CD8+CD28− T-cell counts (A); Treg-cell counts (B); CD4+ T-cell counts (C); CD8+ T-cell counts (D); CD8/Treg ratios (E); and CD8/CD4 ratios (F) in responsive and non-responsive patients 6 months after SABR. Figure S4. 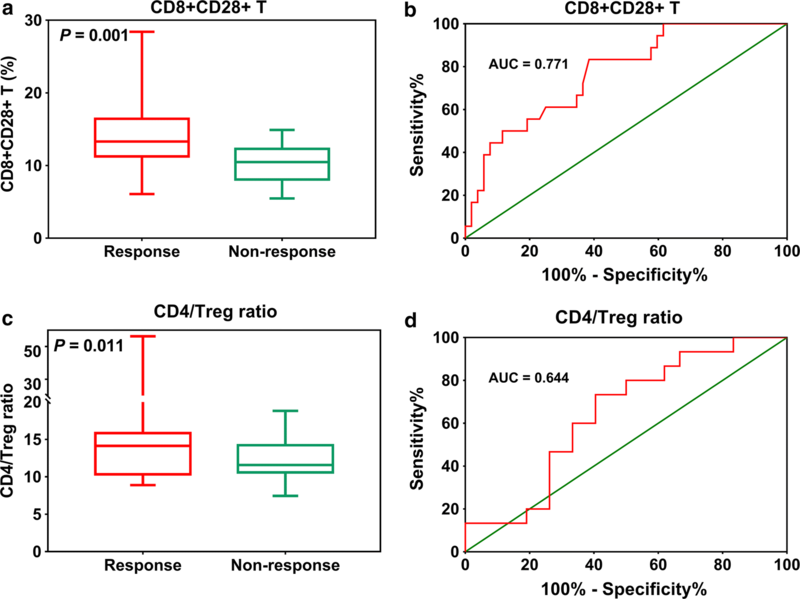 ROC curves for CD8+CD28− T-cell counts (A); Treg-cell counts (B); CD4+ T-cell counts (C); CD8+ T-cell counts (D); CD8/Treg ratios (E); and CD8/CD4 ratios (F) to distinguish responsive from non-responsive patients 6 months after SABR. Table S1. Univariate and multivariate analyses of the likelihood of early tumor response 6 months after SABR.